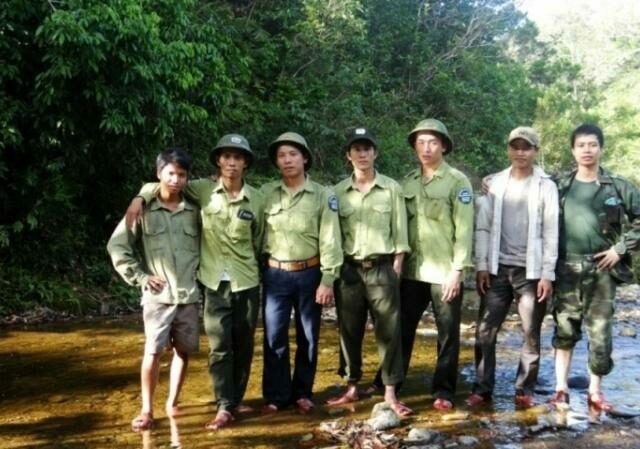 Following the recruitment of two wildlife rangers and the launch of World Land Trust’s (WLT) Carbon Balanced project in Vietnam, the Khe Nuoc Trong forest project is progressing well under the direction of Viet Nature Conservation Centre (VNCC). WLT is funding conservation in Khe Nuoc Trong (KNT) through two different programmes: Keepers of the Wild and Carbon Balanced. Rangers Tran Dang Hieu and Le Quoc Hieu are both employed by VNCC with funding from WLT’s Keepers of the Wild programme. Other key staff have also been recruited by VNCC to manage other aspects of the broader forest protection and reforestation project in Khe Nuoc Trong, which is part funded by WLT’s Carbon Balanced programme. VNCC has established temporary project offices at the Dong Chau Watershed Protection Forest (WPF) Headquarters in Le Thuy district and at the Forest Protection Department Headquaters in Dong Hoi city, Quang Binh. Collaboration between VNCC’s project staff in KNT and employees of Dong Chau WPF is ongoing. The two organisations are carrying out regular joint patrols and working together to set up and operate SMART (Spatial Monitoring and Reporting Tool) to report on and improve the effectiveness of law enforcement and biodiversity conservation in KNT forest. WLT’s funding especially supports data collection, input, analysis and evaluation for improved management. Thanks to WLT’s funding, an additional 34 trail cameras have been put in use and wildlife surveys are ongoing to establish baselines for biodiversity monitoring at Khe Nuoc Trong. Meanwhile, VNCC staff have been engaged in advocacy work and consultation with government agencies on procedures for forest environmental lease in the core area of the KNT forest. This activity has been co-funded by two other funders: BirdLife International and IUCN National Committee of the Netherlands. VNCC’s Keepers of the Wild and other rangers have been developing good relations with members of the local community. In one initiative, the rangers distributed posters and conducted interviews to collect information about sightings of Edwards’s Pheasant (Lophura edwardsi), which is listed by IUCN as Critically Endangered, in and around Khe Nuoc Trong forest. Keepers of the Wild are also collecting information relating to resource use in the forest – fishing, non-timber forest product collecting and wildlife hunting/trapping – to establish to what extent such use is for subsistence or for commercial gain. Looking ahead, VNCC’s project team in Khe Nuoc Trong is planning to improve forest protection measures by reviewing patrolling procedures and mapping patrol trails and to provide motorbikes, field equipment and additional financial support to improve the effectiveness of patrols and other law enforcement activities. The project team also plans to carry out a thorough survey of hunting practices and illegal wildlife supply chains, and to set up a system to monitor the impact of the project on biodiversity and ecosystem services (specifically, carbon sequestration). You can support conservation in Khe Nuoc Trong by ordering Carbon Balanced Paper for printing, or by making a donation to Keepers of the Wild.